Everyone knows the terrific 1940 Howard Hawks movie “His Girl Friday” where the lead character of reporter Hildy Johnson underwent a gender change emerging as one of Rosalind Russell’s best roles. But a couple of weeks ago, I had the chance to see the splendid restoration of the lesser-known 1931 film with Adolphe Menjou and Pat O’Brien, extremely faithful to the play, and solidly authentic in style. The present revival captures that style impressively. John Slattery (quite different from his “Mad Men” role) is just right as conflicted reporter Hildy who is hoping to give up the grind of the newspaper business for an advertising job in New York to please his finance Peggy (Halley Feiffer) and her battle-axe mother (Holland Taylor). 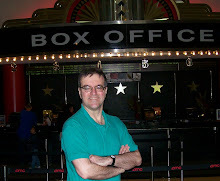 But his long-time colleague, hard-bitten editor Walter Burns (Nathan Lane who comes in like a dynamo in the second act and keeps up the energy thereafter) is doing everything in his power to reverse that decision. Walter is poised to leave town on the eve of the execution of an anarchist Earl Williams (John Magaro) for killing a black policeman. 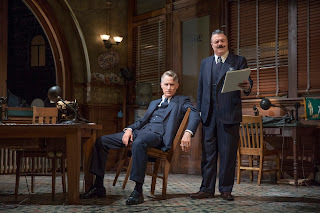 The corrupt mayor (Dann Florek) and sheriff (John Goodman) cover up a reprieve from the governor as the execution will win them more black votes (“colored” is the operative word in 1928). Complications, both comic and near tragic, ensue when Williams breaks out of jail and lands in the press room. Hildy, a heart-of-gold prostitute (Sherie Rene Scott), and ultimately, the overbearing Walter who’s hoping for a major scoop, conceal his presence. 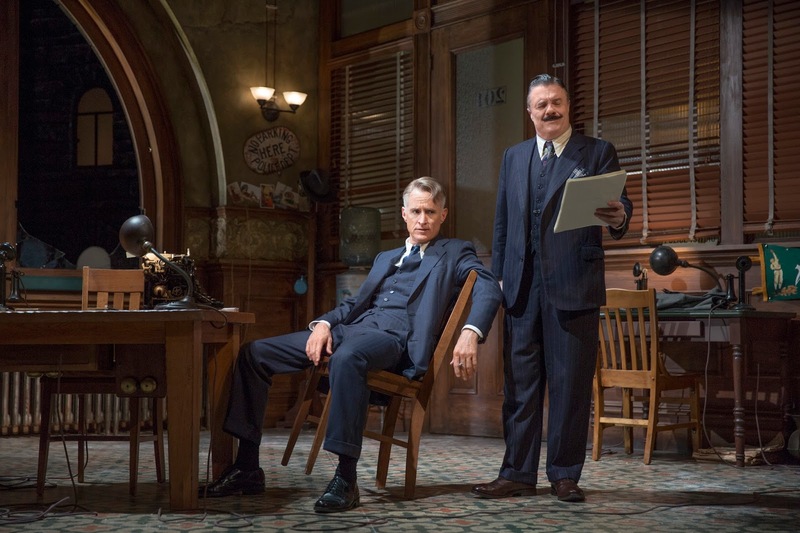 The play is somewhat dated, to be sure, but the snappy dialogue, and the overall air of cynicism on the press side, and corruption on the political, still resonate, and make for an enjoyable evening. All the actors are smartly cast, including Robert Morse as the timid deliverer of the reprieve and Jefferson Mays as a germophobic reporter (both of whom earn generous applause after scene-stealing moments), as well as such pros as Dylan Baker, David Pittu, Lewis J. Stadlen and all the others. The curtain call at the end presents quite a jam-packed stage. Douglas W. Schmidt’s set and Ann Roth’s costumes convey the requisite period aura. Brian MacDevitt’s lighting adds the appropriate muted tone.